Innovation! As far as we are concerned, it will be the keyword underpinning everything that happens at the Fruit Logistica trade fair in Berlin. For three days -6, 7 and 8 February- Berlin will be the place-to-be for the entire fruit and vegetable sector. As in previous years, Quik’s will have a stand at the trade fair. Find out about our innovations and talk to one of our people about the opportunities that Quik’s offers! 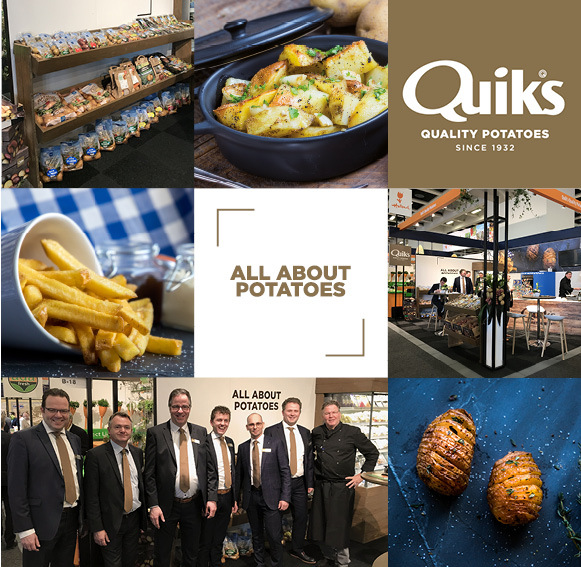 Our chilled potato products and fresh potatoes perfectly match current trends in taste and convenience. Try them yourself at our stand B-18, Hall 3.2, Messe Berlin. No admission code yet? Contact us by telephone +31(0)73-5992093 or send an email to info@quiks.nl. We are looking forward to seeing you at the Fruit Logistica!